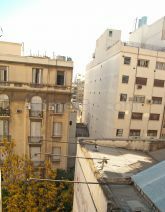 Confortable apartment, quiet, three blocks from the Medicine University. Close to subway lines. Well equipped with --h/c-- air conditioning split - brand new like all the furniture, "tv.cable 29", Wi-Fi (and wired internet), fridge with freezer, kitchen with microwave, gas stove complete with oven. Round table with two chairs. 3 seats comfortable armchair . Near to: Museums, Churches, Parks, Pools, Change Houses, Cinemas, Restaurants, Stores, Banks, Wash Stores, Bus Stop, Theatres, Coffee Stores, Internet Coffee, Gyms, University, Hospitals.